Plainly marked except for a pair of irridescent-green patches on each wing. Favors savanna habitat. 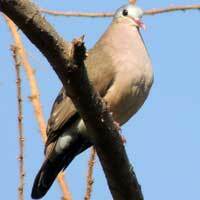 Smallish dove has orange bib with dark speckles. 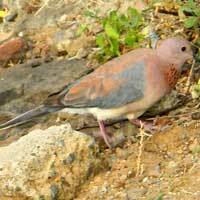 The wings are bluish and the remainder tawny-pink. 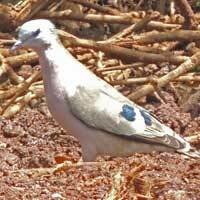 Small pigeon marked with contrasting white and dark brown. Prefers wooded areas. 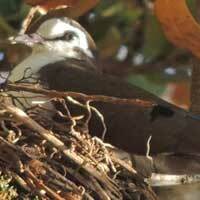 This example is a male on a nest. The trapezoid patches on wings are irridescent blue, but the yellow-tipped bill might be easier to see. Black ring is visible on dorsum of neck. The dark eyes do not have a red/orange ring around the eye. 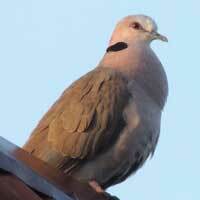 Another stocky pigeon. The black patch at the back of the neck is edged with white. Skin around eyes and the legs are red. 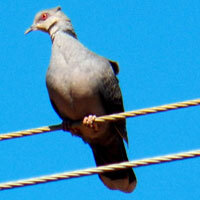 Stocky pigeon with black half-ring at back of neck and reddish skin around eyes and on legs. 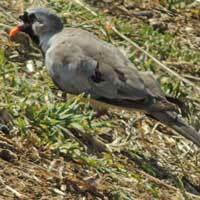 Remainder of bird is largely gray-brown. 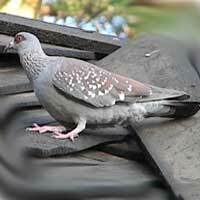 Large common pigeon with a distinct red patch around the eye and white spots on a gray and brown mantle. Bill is orange-red and the tail is long and tapered to a narrow point point. 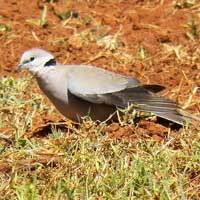 Male birds like this one have a black face. 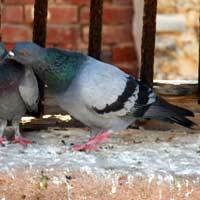 The domestic pigeon. Introduced to Kenya's cities where it thrives as in cities everywhere. Bill is bicolored red and light gray. 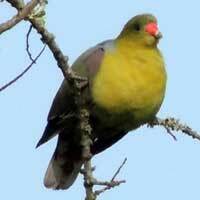 Throat, chest and belly are yellow-green color. Often high in fruiting trees.